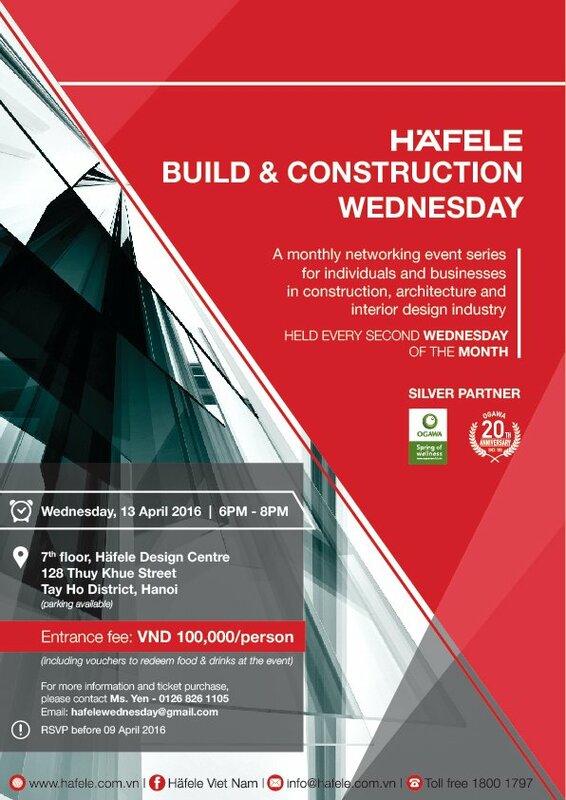 “Build & Construction Wednesday” is a monthly event held by Häfele Vietnam every second Wednesday of the month with an aim to establish good networking opportunities for individuals and businesses in construction, architecture and interior design industry who are interested in the industry’s latest products and trends. Besides, this event also tightens & reinforces the mutual cooperation amongst experts and partners within the industry. In this spirit, Häfele Vietnam is honored to welcome & encourage all individuals and businesses to bring forward and share newest trends, products and ideas at this event, togethercatering to the growing needs of the market. The first event of this kind will be held in the evening of 13 April 2016 at 7th Floor, Häfele Design Center, 128 Thuy Khue, Tay Ho, Hanoi.